How to use 2checkout in Cleanto? 2Checkout (2Checkout.com & 2CO.com) is an electronic payment service (merchant account alternative) founded in 2000 that allows online merchants to accept credit card payments from their customers. ... The one feature that lacks with 2Checkout is a virtual terminal, unless your business is a non-profit. We are providing 2checkout payment gateway in Cleanto. You can easy to use and manage using with 2checkout in Cleanto. Please follow the steps and activate/enable 2checkout in your instance. Step 1: Going to payment tab in setting section and enable 2checkout Payment gateway which is by default disable. Step 2: Fill all the required information regarding payment gateway. After putting the Publishable key, Private Key and Seller id save your settings. 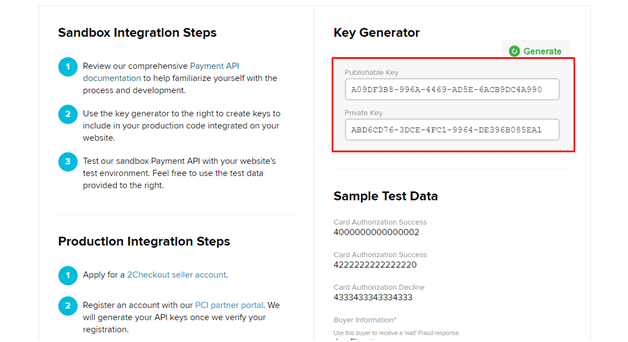 (If you have not any knowledge regarding required fields then please follow next step and check how to get api credentials in 2checkout account). Step 4: After login please going to API menu in your dashboard. Step 5: Here you will get your Publishable key and Private Key.